If Monday’s post didn’t spur you to start early, this one sure should! The longer you work, the shorter you live! 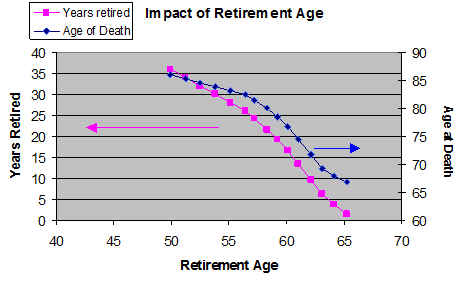 Generally, it is found that people retiring early live more, but how long do they live? 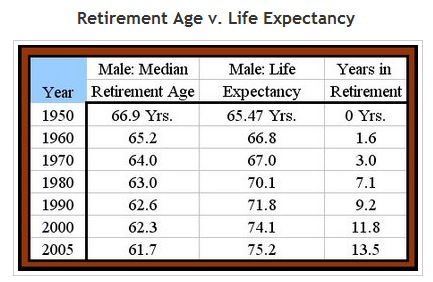 Or what is the average number of years they live after retirement? Well, now 49-50 is usually not considered to be a retirement age in most countries. However, if a person plans everything well and retires at the age of 50, he is expected to live for at least another 35-36 years, which increases the life span to almost 85-86 years! People retiring in their early 50s, normally live up to their late 70s or early 80s and people retiring at their early 60s, live till their early or mid 70s. If you retire before 50, you will live 20 years longer than if you wait for normal retirement age. …. I don’t care whether you intend to retire with $1 million or $10 million, as long as you reach your Number much sooner than you otherwise would. … this, too, is my gift to you. This entry was posted in retirement and tagged 7million, 7million7years, Investing, money, retirement, Rich, Starting Out, wealth by Adrian. Bookmark the permalink. AJ: I am having tons of issues loading your website. I have to hit refresh like 5 times until I see something. This has been happing for a couple weeks now. I use Chrome if that has any impact. I use IE with no issues. Occasionally the link from PFBlogs does not work – but the link from my own blog does. In blunt terms – the message is that the sooner you retire the longer you can expect to live and the quicker you reach your number the sooner you can retire. I use Firefox, and so far no issues. Now on to this post . Its quite telling, and I believe it has lots of merit, as I have seen many of my friends(and relation) who worked to retirement age(to never live long enough ) to collect that retirement money. Now, on to you Adrian. Have you really retired? or are you still working in your current business(es)?If your still working ,you may not have added all those years. Working Part time? maybe you added some. I don’t know how it works(if you need to retire fully)before retirement age ,or if you can still work part time and still add years. I try to avoid I.E. as it is too much of a target with those viruses.Firefox does get targeted,but to a much lesser extent. Very interesting post. So these two variables are correlated but does that imply causation? For example, many people who retire at 50 may be ex-military as they get a pension earlier in their career. These people may be more fit and that is what is extending their age, not the fact they are working. How do you get causation out of this? There may be another factor that is causal?